Born in Atlanta, Georgia, King was the son an Afro-American Clergyman, and was ordained a Baptist minister when aged 18. His first pastorate was at Dexter Avenue Church in Montgomery, Alabama. There, in 1955, he led a boycott of the bus system when Rosa Parks a member of the Montgomery Branch of the National Association for the Advancement of Coloured People, was jailed for refusing to give up her seat at the back of a bus to a white person. The Montgomery boycott resulted in violence against black protesters, including the bombing of King's home. National media attention focused on the city. Finally the Supreme Court of the United States ordered Montgomery's buses to be de-segregated. By late 1956, King was a national figure. 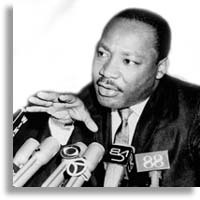 In 1957, King co-founded the Southern Christian Leadership Conference (SCLC), an organisation of black churches which encouraged non-violent marches, demonstrations and boycotts against racial segregation in all forms. In 1963, the SCLC participated in a protest in Birmingham, Alabama. Hundreds of singing school children filled the streets in support. The enraged police commissioner ordered in police with attack dogs and firemen with high pressure hoses. King was arrested and jailed. When released, he helped to organise a massive march of civil rights workers in Washington, D.C. There, in front of 200,000 supporters, he delivered his famous "I have a dream" speech: "I have a dream that one day this nation will rise up and live out the true meaning of its creed: 'We hold these truths to be self-evident: that all men are created equal.' "I have a dream that my four children will one day live in a nation where they will not be judged by the colour of their skin but by the content of their character. I have a dream today." The Washington march and King's speech created the momentum for the Civil Rights Act of 1964: prohibiting segregation in transport and discrimination in education and employment. In recognition of his effective and non-violent leadership, King was awarded the Nobel Peace Prize in 1964. Martin Luther King Jr. was shot to death by escaped white convict James Earl Ray in 1968.